A few days ago, I was walking a shelter dog when a car did a “rolling stop” (think brief pause) at the stop sign before proceeding through the intersection I was crossing at the time, forcing me to stop in the middle of the street and wait until it passed. The car was going slowly enough that I had plenty of time to see it and stay out of its way, so there was no real danger that I was going to be hit. Still, I was a pedestrian (two pedestrians if you count the dog), crossing legally, and the car should have waited at the stop sign until I was safely across the street. And there was no doubt that the woman who was driving the car saw me, because she turned and stared at me as she drove by. I would be lying if I said I wasn’t a bit ticked off. I glared at her, although my sunglasses probably meant she couldn’t see my angry expression. 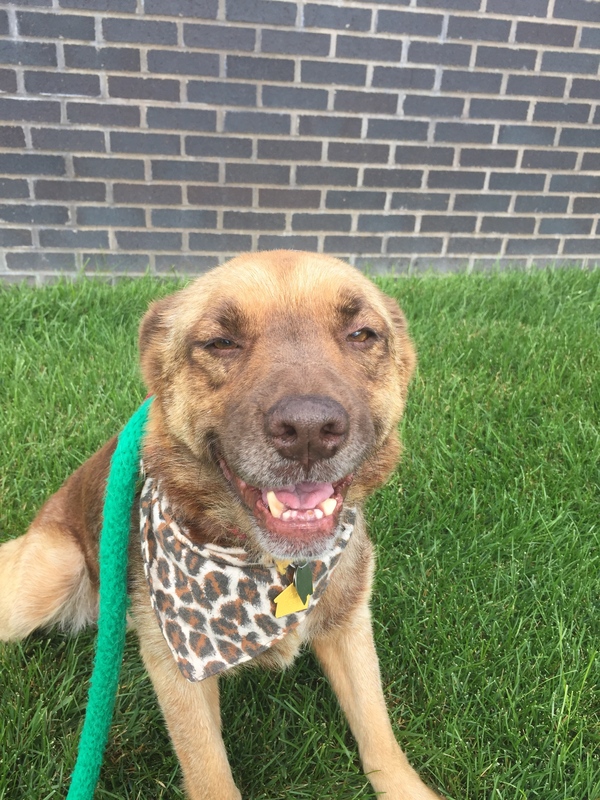 And when I saw her pull into the shelter parking lot and get out of her car, I made a special note of what she looked like. Then I mentally rehearsed exactly what I would say to this woman if our paths crossed, and none of it was particularly nice. I was going to point out that stop signs mean “stop” and not simply “slow down a little,” especially when someone is in the crosswalk. And I was going to ask how she was so certain that I would actually see her in time to stop and not get hit by her car? I was right and she was wrong, and I wanted to make sure she knew it. But she stopped at the front desk, and didn’t come near the area where I was returning my dog to its run and leashing up the next dog to take for a walk, so I lost track of the woman until about twenty minutes later, when I saw her leaving the building just as I was coming back in. I don’t know if she remembered me or not, but she smiled pleasantly at the dog I was walking, and rather than pointing out the error of her ways, I found myself smiling at her and saying hello. She responded by beaming back at me and adding, “What a cute little dog you’ve got there!” I agreed that he was, and went on my way. Now you might think that I was ashamed of myself for wimping out, or that I was nice to the woman simply because I was am shelter volunteer and she was a potential client, and I am always nice to the clients. But neither would be true. I was actually just happy to discover that this woman, who had aroused such fury in my heart just a little while before, was actually very nice, even if her driving skills left a lot to be desired. I actually felt more lighthearted in that moment than I had all day. Yes, she had “done me wrong,” but I let go of the need to point that out to her, and I’m glad I did. We share our world with millions of other human beings, most of whom are going to do things we don’t like from time to time, sometimes intentionally but more often not. Maybe this woman really didn’t see me when she pulled away from the stop sign and only saw me when she was passing me, and that was the reason she turned and stared. Or maybe she was just in a hurry and made a very bad judgement call. I’ll never know. What I do know is that all of us make mistakes, all of us occasionally misjudge people and situations, and all of us sometimes get a bit careless when we are in a hurry. I also know that when we see someone else making those mistakes or bad judgments, its only natural to want to point it out and correct them. But I don’t think its necessary or helpful to do so, as no one likes to have their faults pointed out to them. Usually pointing out someone’s mistakes just makes that person defensive and angry, not remorseful and determined to do better next time. Obviously, we do have a moral obligation to speak up when someone (human or animal) is being neglected or abused, and I will always do that. But I’m not talking about anything that serious. I’m talking about all the little times in the day when we feel wronged by someone else, or notice that someone is not doing things exactly the way he or she should, and want to let them know about it. I honestly believe that in those cases, its much better just to “let it go,” and that when we do, everybody benefits. Really enjoyed this today Ann and everything you said is so true. I’ve been in that same situation at the same stop sign and crosswalk and glad that you and the dog were safe. Yes, that intersection is always a bit of a challenge! Thanks, Dianne! Good for you, Ann, and what a great post. Thank you for sharing something we should all think about and consider. I appreciate it! Thank you Jodi! You are always so kind. I just took a long deep sigh………it felt good……I let it go. Thanks, Deb… You know what I’m talking about, I’m sure! As someone who has inadvertently made many, many, many mistakes over the years, I tend not to get too upset about minor failures of judgement that come my way. The one thing I really can’t abide, though, is intentional nastiness. If somebody is deliberately mean or selfish, that goes into a completely category in my brain from those who unknowingly inconvenience me by being thoughtless, foolish or whatever. I agree. Cruelty is not something to be overlooked in the same way that we overlook mistakes, errors of judgements, or just plain having a different idea of how things should be done. There’s no excuse for being mean and nasty to someone.